are in violation of section 403 of the Federal Food, Drug, and Cosmetic Act (the Act) [21 U.S.C. § 343] and its implementing regulations found in Title 21, Code of Federal Regulations, Part 101 (21 CFR 101). Just Mayo and Just Mayo Sriracha are the two products, and their crime is that they do not contain eggs. So they cannot be called “mayo”. 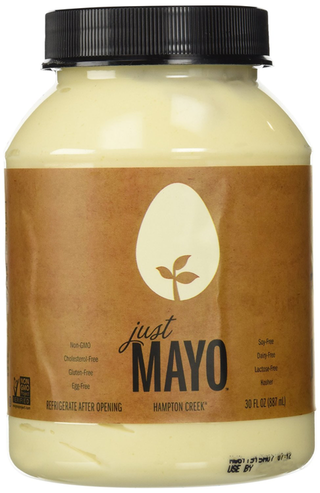 Who sicced the FDA on Hampton Creek? has become the big question, as a pile of emails winkled out of the government by a Freedom of Information Act request seem to show that the American Egg Board orchestrated a campaign against Hampton Creek. I mentioned the story in my newsletter three weeks ago, which prompted Peter Hertzmann, an independent researcher and a friend, to suggest that the reality, as ever, is not quite so straightforward. Peter was good enough to fill me in on some of the background. Peter Hertzmann’s website is well worth exploring for all sorts of good things. The American Egg Board is just one of several commodity checkoff programs. There have been some very interesting challenges to the whole idea of a mandatory checkoff, one of which recently featured on BackStory, a history podcast. I did ask if I could use it, but no reply yet; you can hear the segment here, but you will need a sharper legal brain than mine to decide whether mandatory funding of something called government speech raises First Amendment concerns. What got Peter and me into the sciencey discussion of mayonnaise and emulsions was his mention of the Harvard University Science and Cooking lecture series. I’m mortified to admit that I didn’t know about it. Many of the lectures are on YouTube, and one in particular that Peter pointed me to showed Nandu Jubany from Can Jubany restaurant in Spain making an aioli from nothing but garlic, salt and olive oil, and a bit of water. You can see him do that from about 13:30 to 17:30 in this video, but the intro, on emulsions, is worth watching too if you want to a better understanding. I’m sharing, without comment, some of the AEB material obtained by Ryan Shapiro. The FDA’s letter is, of course, online. The banner image of a mayonnaise emulsion under the microscope is from a scientific paper on substituting eggs with a modified potato starch.